Which, of course, is not to say that its products are bad: they may be startlingly good, of course. The treVolo S is actually a second bite of the cherry. The treVolo – without the S – first appeared early last year in a broadly similar configuration. 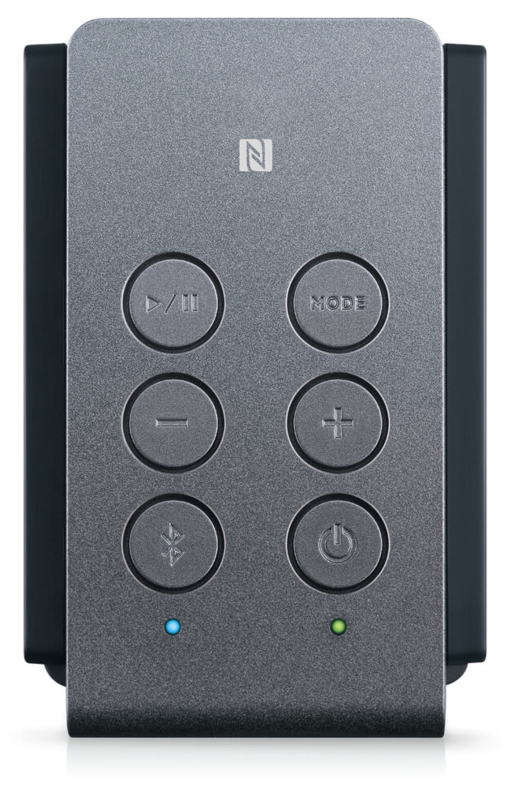 The ’S’ includes Bluetooth 4.2 instead of 4.1, no support for aptX (the older version does offer that support), NFC support, a stereo duo mode for a second unit, the old microphone has been removed while the power rating has been reduced to 5V from 12V. It’s also slightly smaller and lighter than the older model: 1kg as opposed to 1.2kg. 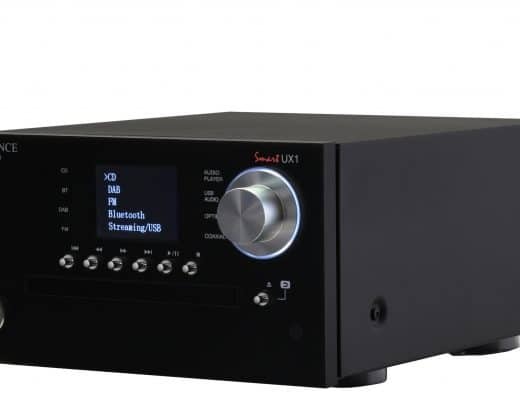 The new version includes a central chassis holding a 12W amplifier and dual bass drive units. On the top are the recessed interface buttons allowing you to change the sound mode (a series of basic EQs), play/stop, on/off, volume up/down and Bluetooth pairing. Around the back is a mini-USB charge port plus a 3.5mm wired input option. 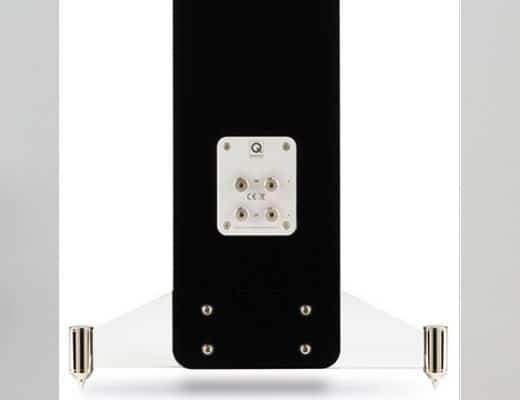 On the sides are two hinged, flat electrostatic speakers handling the upper frequencies. It’s a lovely looking thing – rather funky and stylish and is interesting to the eye. You can’t help but gaze upon it, as it where. But what does it sound like? I began with my iPhone 8 and connected to the unit via Bluetooth, playing Marvin Gaye’s Mercy Mercy Me via MP3. A poor quality audio format, any Bluetooth speaker has to adapt to the nature of this lossy file. In effect, conning the ear and being kind to the output. Delivering a sound that is not too ‘real’ or, in other words, damaged and partly disabled. Anything too audiophile is not a great thing when playing MP3 files. Too much truth, as it where. 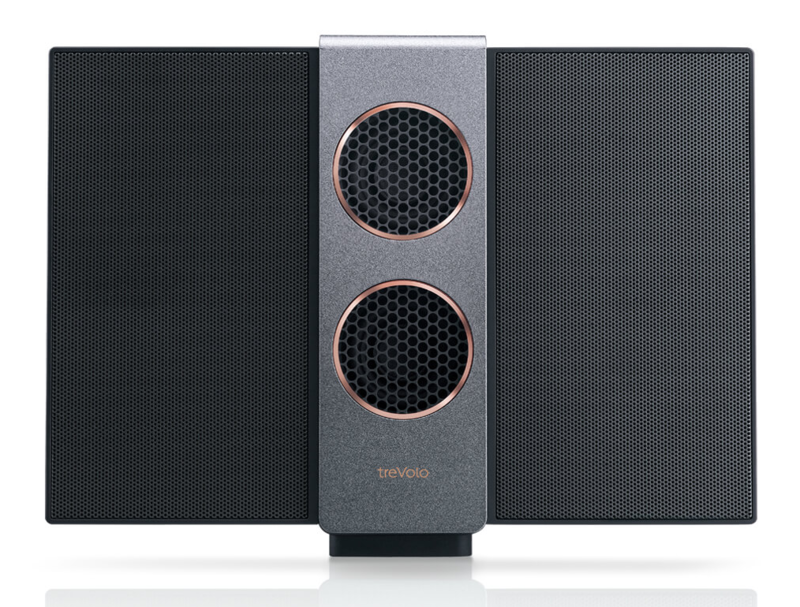 I initially tried the treVolo S as a ranged speaker, listening as I might to a larger hi-fi unit, with the hinged ‘winged’ speakers folded back, just to see how that affected the output. As you might expect, there was a lack of detail in this configuration with clarity taking a back seat and the general midrange appearing dull. The song was perfectly listenable and did well to fill my large listening room at full volume without and distortion imposing on the output. Sound quality was not particularly edgy for a lossy file although there was a touch of strangulation around the user mid areas and in the treble. Bringing the ’S’ nearer to the ear for near-field listening aided detail retrieval with bass having a slightly more mature presence while the mids provided more articulation. Still, the general consensus was ‘could do better’. While treble remained pinched and thin and upper mids lacked dynamic reach, there was more detail on offer with the wings spread, more air and space entered the music giving a greater flow to the sound and, although low frequency power hovered around the zero mark, there was a slightly enhanced punch to the low end. Bringing the ’S’ to a near-field position, more subtle detail could be better assimilated by the ear. Secondary percussion, for example, was better articulated. Using the downloadable BenQ app (available for iOS and Android), I turned the 3D Sound option on to produce an infusion of air and space to enlarge the soundstage. The vocal was pulled back into the mix and the background instruments took a more equal part in proceedings. I found this mode improved the overall sound, reducing listening strain and smoothing out the mids somewhat. But enough of MP3. It was time to push the hardware with higher resolution music. I played Sonny Rollins St Thomas at 24bit/96kHz via Audirvana Plus through my SSD-powered MacBook. I kept the speaker wings open and decided that near-field operation was best in terms of playback quality. I was delighted to hear an increase in sound quality from the treVolo S in terms of general clarity and midrange maturity. Although there was a slight upper midrange noise quality from the streaming component itself (a sort of subconscious high pitched ringing that can be felt more than heard), the enhanced information from the higher resolution file was certainly noted by the unit. I did punch in a selection of EQ modes offered by the ’S’ but found that the default was the best, the others merely removed portions of the sound, stripping it of bass emphasis, midrange emphasis and the like. 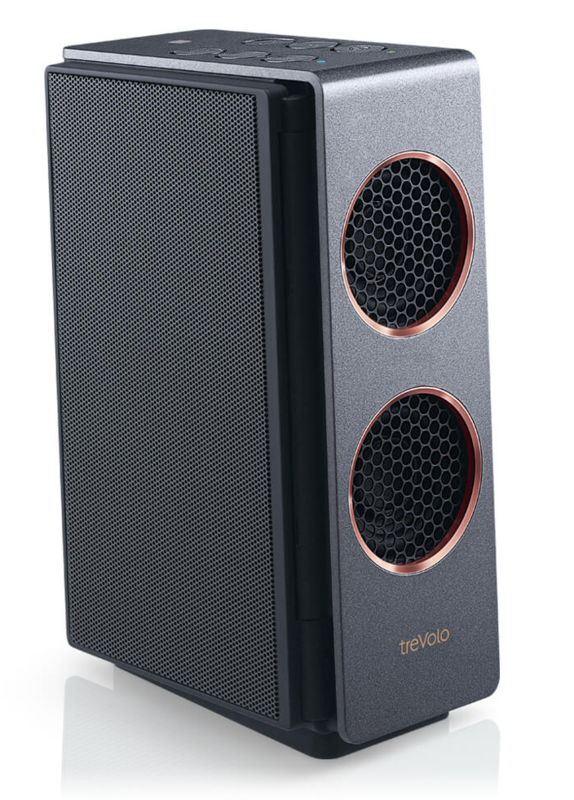 If the ’S’ is not pushed too hard, the general sonic output is quite listenable (max out the volume and the treVolo S’s speakers strain and cause listening fatigue). 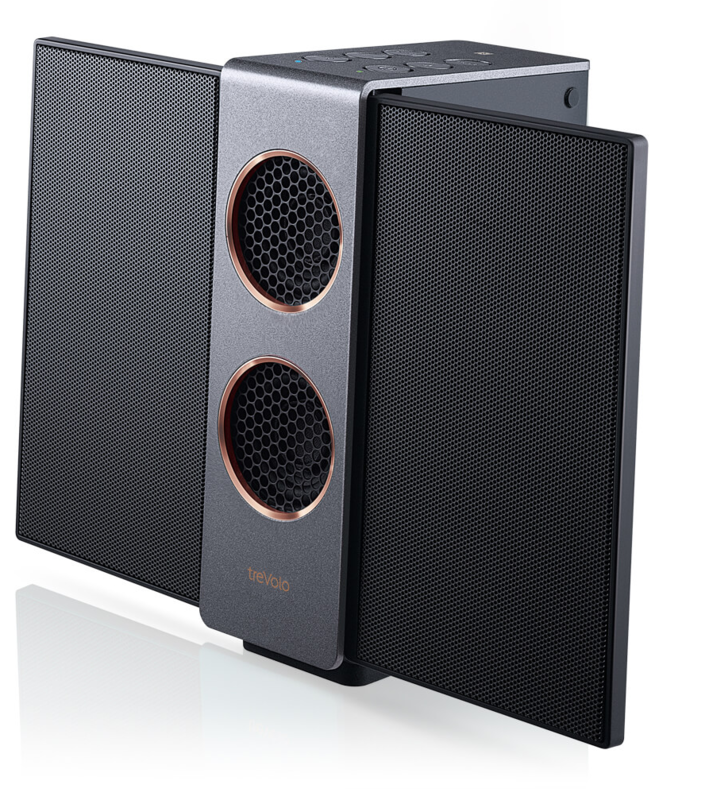 Sure, the tiny speakers offer no bass to speak of, just a lower midrange/upper bass melange to only suggest the bass frequencies. That said, the general sound output is pleasant and inoffensive. 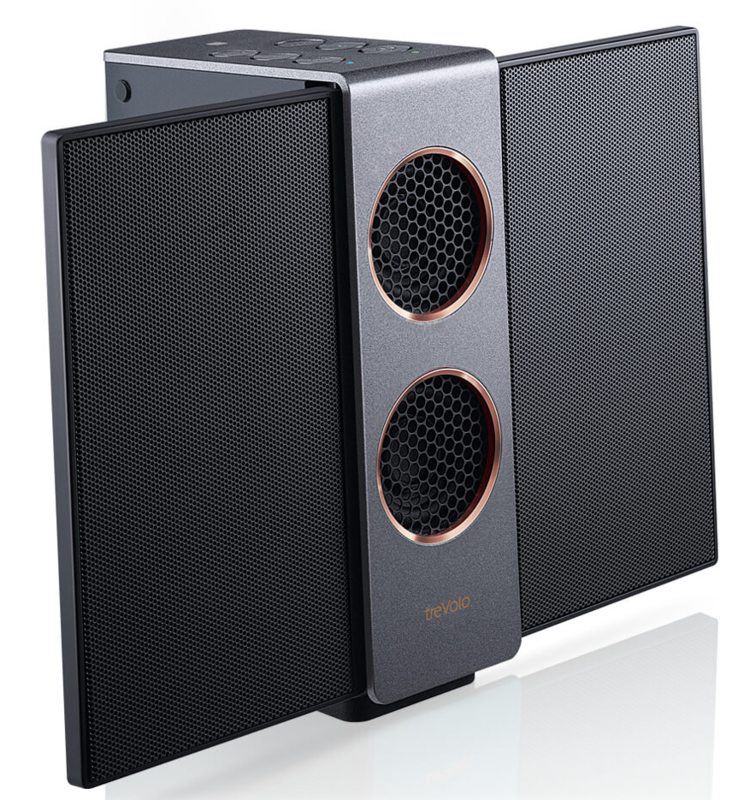 I finally tried the speaker in wired mode with my laptop (you can use both the Aux or, apparently, the USB socket – although I only learned of the latter after the review. The manual only makes a confused reference but no explicit mention of this. Similarly, the 3D mode can be accessed via the chassis but the muddy instructions are less than clear abut this too). Of course, wires can be had in long lengths but it defeats the entire reason of having a Bluetooth speaker in the first place and also the wire remans an inconvenience. Nevertheless, in this mode the speaker sounded at its very best. 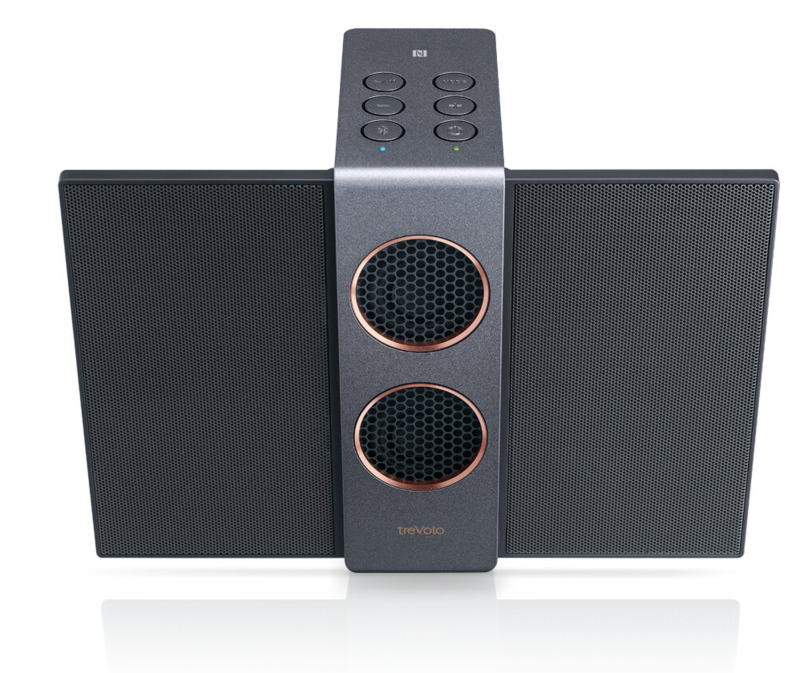 Relaxed and with a midrange flow that was easy on the ear: the high frequency noise of the Bluetooth streaming had now gone, of course. 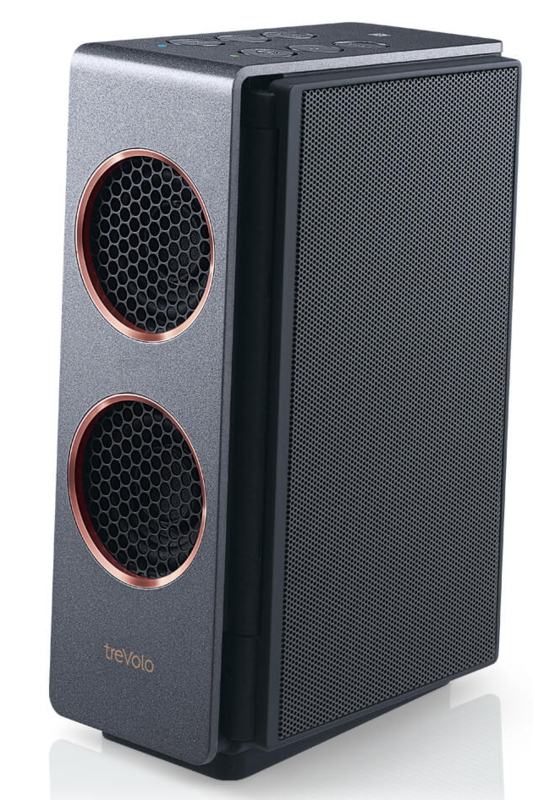 If you do buy this speaker then, on an office desk or similar, in near-field operation but in wired mode is by far the best set-up with Bluetooth acting as a back up when necessary. Wired mode should be seen as the primary listening mode. Here, the saxes sounded relaxed and relatively organic while the percussion, while not tonally accurate, did move with a certain elegance and rhythmic flow. I wonder if the electrostatic gimmicks up the price and I also suspect that a similar level of sound quality could be attained by a more traditional technological route which would probably cut the price by a substantial amount. Hence, value for money is not the best. Nevertheless, the ’S’ does retain a certain style which ‘looks good’ on a typical desk. The electrostatic idea is a nice one but doesn’t really impose itself within this miniature Bluetooth speaker unit. That is, in sound terms, it doesn’t really stand alone. It doesn’t scream ‘electrostatic’ to me. 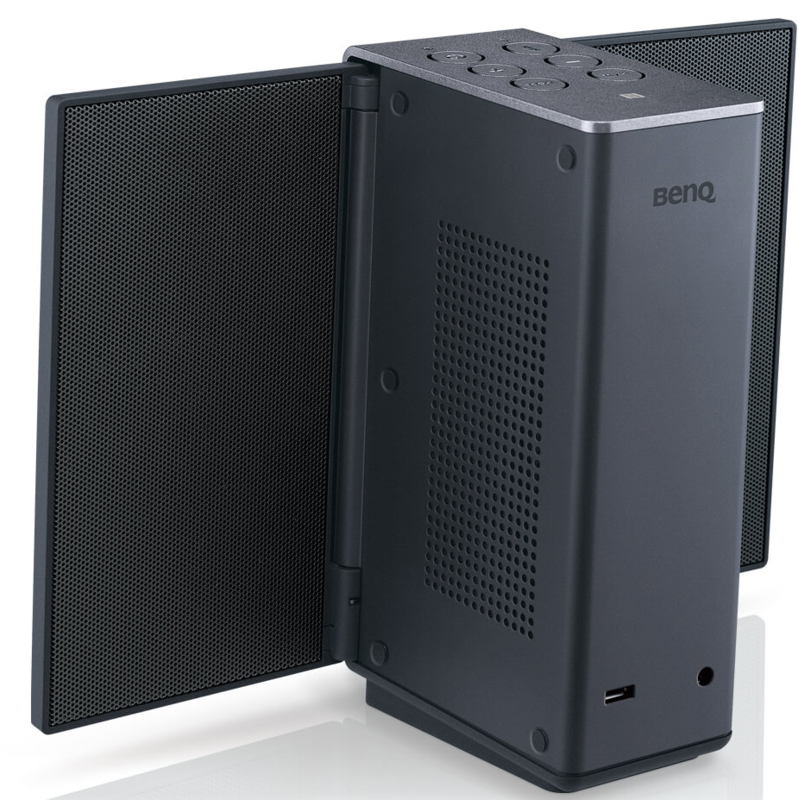 It’s a sort of ‘proof of concept’ Now that BenQ have proven that it can be done, they should now work on making the technology sing for its living. 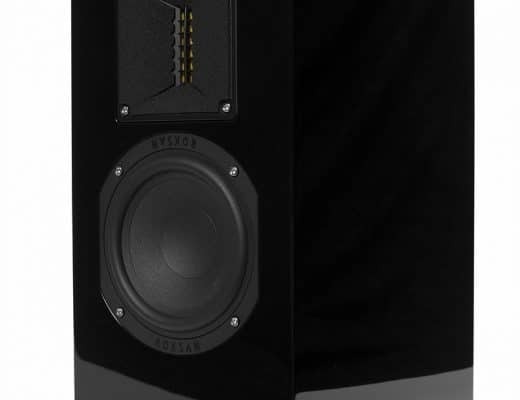 As such, it’s a fun speaker that looks good and sounds pleasant enough. It is refreshing to see a straight forward review that highlights the good and the not so good. Too often reviews end with “despite all of the above this is a great product”. Here it clearly states that it is pleasant with work yet to be done. Thanks for being different. Many thanks for your kind words Gerret.